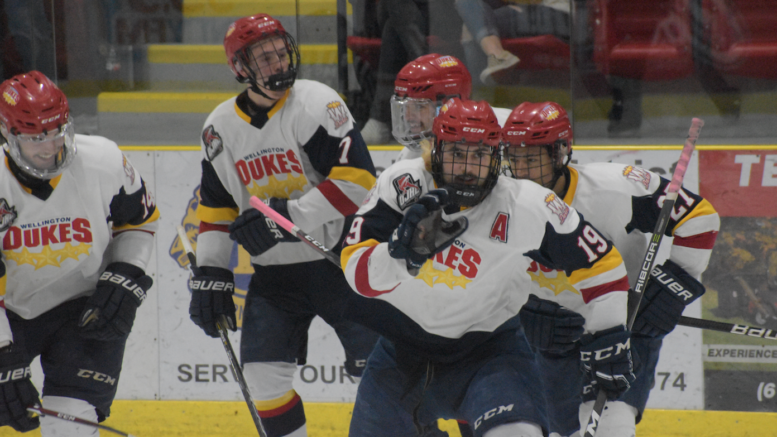 When they hit the ice at the Herbert Carnegie Arena in North York on Thursday night for Game 5 of the 2019 Ontario Junior Hockey League Buckland Cup Semi Finals, the Wellington Dukes will have a chance to punch their ticket to the biggest dance in Ontario Jr. A hockey. The bounces Wellington wasn’t getting early in the Whitby series have come back to the Dukes in spades and the locals were certainly benefitting of a few breaks in the game on Tuesday. But hard work and gutty determination are certainly behind those breaks and their success thus far in this round shouldn’t be confused with just dumb luck. Wellington coach John Druce said post game Wellington was benefiting of a couple of bounces and they were nice to have but also credited North York for not quitting and battling right up to the buzzer. 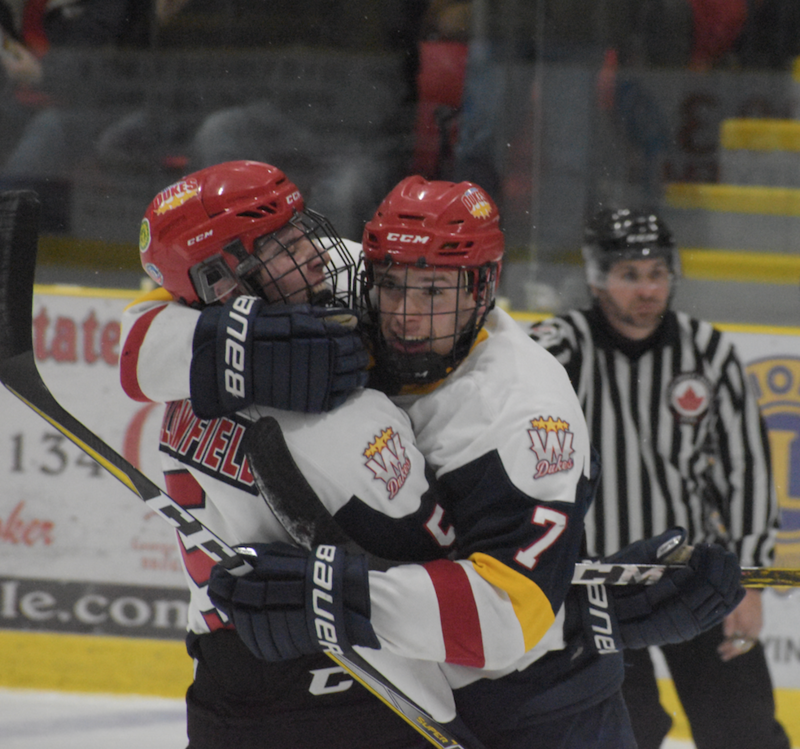 In terms of coming back from a 3-1 deficit, Wellington only needs to look back to their previous round where they erased such a margin and defeated the Whitby Fury in Game 7 of the East finals. “We’ve talked about how critical Game 5 is and how we need to bring our best effort of the season on Thursday night,” Druce added. At home or on the road, one factor endures-Wellington fan support. The Dukes fans outnumbered the Rangers faithful in Game 3 in North York thanks to a fan bus and on Tuesday, more than 1,000 packed Lehigh Arena to see the hosts score seven times in a game that might have felt closer than it actually was. Wellington opened the scoring at the 8:16 mark of the first when Frank Vitucci made a nice pass from behind the net to Ben Woodhouse cruising to the crease and the Hamilton, ON native beat Rangers goalie Jett Alexander between the legs to make it 1-0. One of the aforementioned bounces came on Wellington’s second goal just over seven minutes later as Andrew Rinaldi’s pass from the corner redirected past Alexander off Brett Humberstone’s leg and into the North York net for a 2-0 margin. In the second, Wellington continued to pour it on. Tyson Gilmour broke through the blueline on a powerplay rush and beat Alexander clean upstairs for a 3-0 spread. After scoring the overtime winner in Game 3 and then potting the eventual game winning tally in Game 4, Gilmour, or Killer Jr. As some of the media have been calling him this post season, admitted he’s shooting more as the playoffs are wearing on. “I felt a little snakebitten early in the first and second rounds but after I scored in the Whitby series, I started to shoot a little more and it’s paying off,” Gilmour told the Gazette. Shortly after the Gilmour goal, North York’s Dante Spagnuolo would finally solve Wellington starter Logan Bateman at the 2:48 mark off a scramble in front of the Dukes net. Zach Uens would send a powerplay goal past Alexander at the 8:44 mark to make it 4-1. Then, another bounced came Wellington’s way on a 2-on-1 rush. Dan Panetta, trying to make a pass at the face off dot to Vitucci would have the attempt blocked but the puck went right back to Panetta’s stick. With Alexander biting on the pass, Panetta was able to fire the puck into a wide open Ranger net at 16:12 to make it 5-1. Bateman was busy at the end of the period with a few big saves as Wellington was able to carry a four goal lead into intermission. Early in the third, North York’s Nick Leshuk was able to beat Bateman on a shot the Ottawa native would have liked to have back to make it 5-2 but Wellington continued to churn out the offence. North York reliever Eli Shiller was under fire for much of the period as the Rangers boiled over in frustration and seemed more satisfied to exact a physical toll on Wellington instead of attempting a comeback. Vitucci would score a nice powerplay goal thanks to a glorious feed from birthday boy Kennan Eddy at 9:05. While there was certainly no denying Gilmour’s skill in the regular season, the graduating centreman has elevated his game more and more as the stakes have been raised higher. 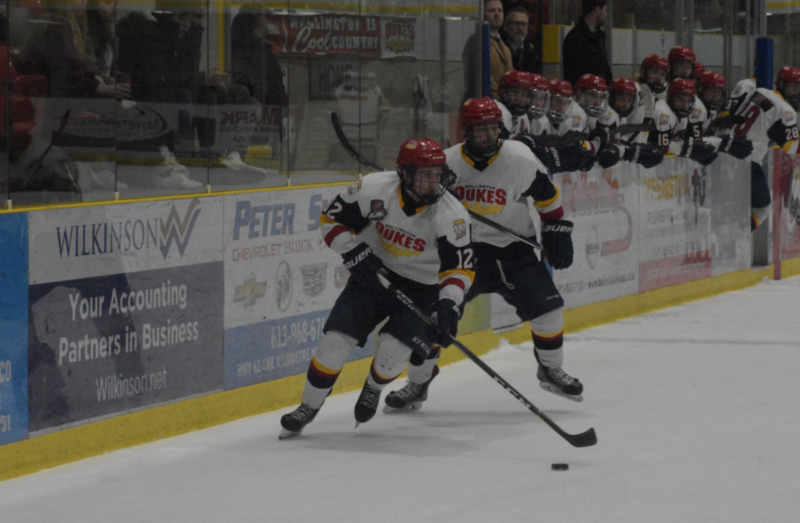 After surviving Cobourg and Whitby in previous rounds, Wellington is in another tough and physical series but the coach believes the club gets prepared for this type of hockey through the rigours of playing in the toughest division of the OJHL. As the rest of his junior career can be measured in days not months or years, Gilmour said he and the veterans have been soaking in the experience of a Jr. A playoff run in Prince Edward County and Tuesday night’s large turn out of hockey fans added another layer to it. “It’s been awesome. I know the veterans have bought in and want it to keep rolling. This has been a great experience and I’m so thankful to be a part of it here in Wellington,” Gilmour said.